The real reason I only spent one full day in Paris was… I wanted to go to DISNEYLAND! Spending all day in Paris was wonderful and I made the most of it, I really did! But for those of you who know me and those of you who don’t, I am a HUGE Disney fan, and I am talking HUGE! I have been to Disneyland in California well over 15 times. I have been to Walt Disney World Florida, twice. Now I have been to Disneyland Paris! 3 parks down, 2 more to go on the bucket list! The next series of posts will bore you if you are not a fan of the land of Disney. Sorry about that, but talking about the land of magical wishes is fun for me…so bear with me. I understand there are people out there who don’t understand my Disney passion. I don’t expect you too. Just like I don’t get your need to go to Vegas every time you can, or pop off to London as often as it calls you. Nor do I get the need to go to Toronto, Winnipeg, Vancouver or THE LAKE. I really don’t understand the need to go to Mexico every year, but you don’t have to listen to me say “Why do you do that?” with disdain on my face. You know why? Because I respect that you need to do things that make YOU feel fulfilled. It is YOUR mental break, not mine. My mental break is in the Land of all things Disney. When I was 6 my parents drove from Edmonton to Los Angeles one summer. We were living in Yellowknife, North West Territories. So technically the trip was from the Arctic to California, with a giant rest stop in Sherwood Park to visit my grandparents and pick up my aunt ( who was 11 at the time). I knew we were going, but still han’t grasped the idea of what it meant. The trip itself was great, I remember traveling along the Oregon coast, seeing giant redwoods, the Pacific ocean for the first time, and I can remember vividly, oranges growing on a TREE! ON A TREE! This was the very first time I remember loving to travel. I loved seeing new things. I caught the bug. I was hooked. I was a traveler. I remember small bits from my trip. 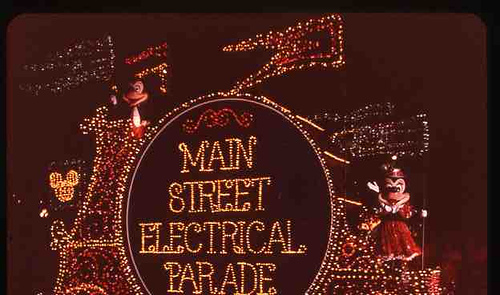 Sitting on the corner of Main Street, in front of the Emporium, watching the Main Street Electrical Parade float by. 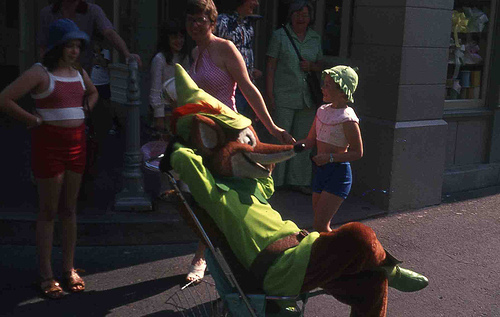 I remember Robin Hood sitting in my brothers stroller and thinking I am in love! I remember how happy my dad was and how much fun he had. I remember my mom closing her eyes on every single ride because she was to scared to see what was going on. mostly I remember the feeling. The feeling of being swept away to a magical place, filled with details that will amaze you if you take the time to look for them. Every trip after the first one was better than the last. The Land of all things Disney change. It never stays the same. The feeling is the same, details, rides and music change. This is reason one, why I like going back so often. I enjoy change. Hard to understand when I go to the same place as often as I can, but it is true. I love spotting the difference too. I love how small things change like tiny details such as light posts, or larger changes like rides who give nods to rides of the past that stood in their spot. It’s like belonging to an exclusive club where secrets are only given to members. If you plan to go for the first time and wish to know some of the secrets, I recommend you give Werner Weiss a visit at Yesterland. He will let you know what Disneyland use to look like. It’s a fun trip down memory lane for those who were there before. I introduced my husband to the magic, he was hooked too. Although I suspect he puts up with my passion more than he loves it himself. The offspring were hooked. I’m sure my enthusiasm was part of the reason they loved it so much. We felt we were ready to expand our horizons. We needed to move on to a larger space. Bring on Walt Disney World. The two places cannot be compared. Florida is as different from California as peanut butter and jelly. The two work together, but are very different. So please don’t ask me which I love more. Just like you can’t tell me which child you love more. You love them different but the same. Make sense? Our last day in Paris, we had breakfast in the hotel with my parents. Kissed them good-bye, and walked to the Metro station 2 blocks away. We boarded the train heading in the opposite direction of every other commuter, who were heading into Paris proper. Two stops and we were there. Climbing out of the Metro and into, what would be known as the Esplanade in Disneyland, CA, we followed the hoards of Cast Members as we ready ourselves for rope drop. If there is one thing I know, be early for the opening or miss out on short lines. I was prepared. I couldn’t wait to start! Around the corner, we saw the fist glimpse… The Disneyland Hotel which could only mean one thing, we were at the gate. My ex-wife was a big time Disney fanatic, so it’s hard for me to work up any passion over it – I don’t think I could walk into the park without thinking of her, and god knows I sure as hell don’t want to do that, so I think I’ll just live vicariously through your posts for now. ouch! I completely understand!!! That is why I hate log homes. The ex and I built one. nuff said. I had to go to the one in Orlando, FL 4 years in a row because my daughter was in the Nationals for cheerleading…that is the only one that I have been to! 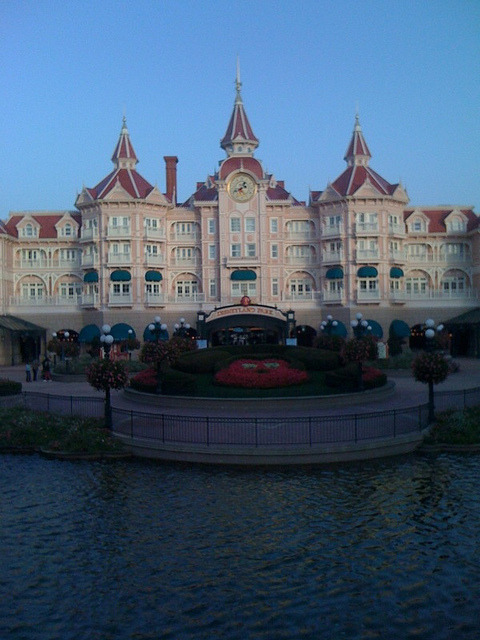 Disneyland Paris is delightful – a Disney fan like you must have been in heaven. Or paradis, n’est-ce pas? Glad you had fun. It was wonderful, I loved how Mickey spoke French! Without a hint of an accent, I might add. Because you are an expert in accents? LOL! Just had the chance to check out your blog. Completely agree with your post. Disney will always be the happiest place on earth for me. I am running right now to check it out! Thanks Amee! My parents and my little brother and I have only been to Disneyland in Calif. It was on the way back from my first trip to Mexico (I hear you wincing!). I was about 9, brother was 7, and I’m sure we had a blast. All I can recall is watching Jaws in the hotel room, it scared the crap out of me! I wanted to get home to snow, far away from oceans with giant killer sharks! Clearly anywhere there are sharks, that is not YOUR happy place lol! You take the term “HUGE fan” to a whole new level sista! I totally respect your passion for it! That is awesome- I am actually quite jealous that you have been able to go so many times. I have been to Walt Disney World in Florida. The year was 1998. (Feels like forever ago). My parents had won the trip through work. It was a HUGE thing for us. We had never been to America, and the longest flight we had ever had was 11 hours to London. We were going to America. Was it going to be like the movies. Miami International Airport was a sight for us. The first policeman we saw was a muscled machine who was wearing skin tight hot pants. Disney World was mind blowing for us. My dad hired a motorised chair, we were all embarressed about this…. this was not okay. My poor brother was only 8 years old, and sat outside waiting for us on so many of the rides. Too much for him. So yes, I can not wait to be able to go back… but it wil need to be when Princess is older, and oh yes- when i have some money!